Manual handling is one of the big health & safety issues that we face in the rail industry today. Trough-Tec Systems supply lightweight polymer Green Troughs for cabling across the UK rail network. The Green Troughs are significantly lighter than concrete ones offering an immediate manual handling benefit. Aquarius are proud to be collaborating with TTS Rail to provide a better transportation solution: delivering troughs to the track side, reducing logistics and maximising the possession. 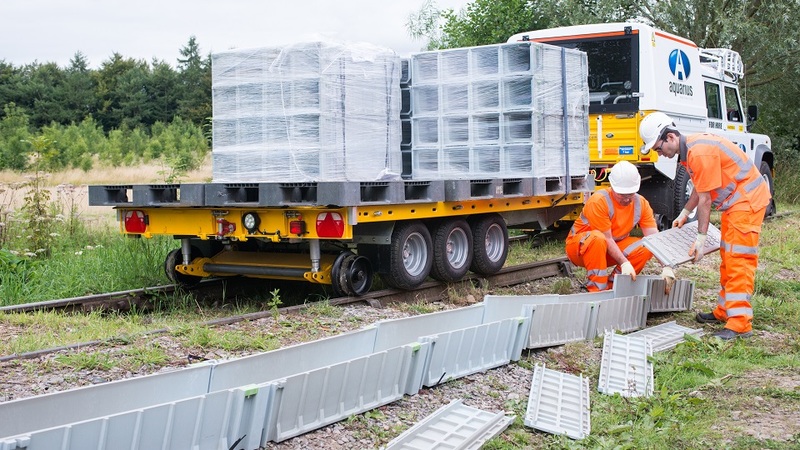 We recently carried out a successful trial with TTS Rail which demonstrated that up to 120 metres of Green Troughs could be set out on track per hour using Aquarius’ brand new Road2Rail Trailer and R2R4x4. The R2R Trailer is preloaded at the depot with 84 Green Troughs, driven from the depot by road and on-tracked in minutes under live overhead lines. No need to wait for an OLE isolation: maximising your possession time. Up to 5 personnel are transported as well, reducing the need to walk on track. Subsequent troughs are loaded at the access point. Allowing for additional loading, we estimate 400 metres of troughs can be set out in a 4 hour possession, with 1200 metres during a 12 hour weekend shift. You can see a video of the TTS & Aquarius trial here click on image 2 to play.